François Linke (1855-1946) is renowned as one of the most important and celebrated cabinetmakers (ébénistes) of all time. 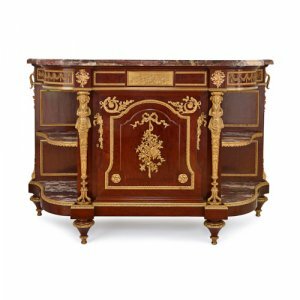 Born in 1855 in the Czech Republic, Linke moved to Paris in 1875, where he began working with the established cabinetmaker Joseph-Emmanuel Zweiner. Towards the end of the 19th Century, taste for the late French Ancien Régime style was at its height. 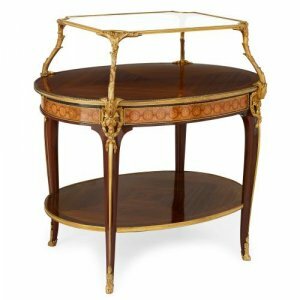 Linke played an important role in the revival of the Louis XV and Louis XVI furniture styles, which greatly enhanced his reputation. However, Linke’s overriding ambition was to create a novel style that blended both antique and contemporary traditions. Together with the sculptor Léon Messagé, Linke created original designs that drew inspiration both from the historic Rococo style and the contemporary Art Nouveau style. 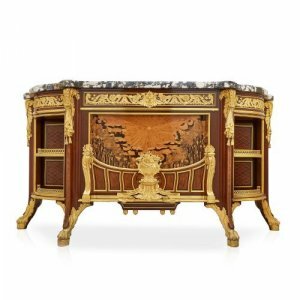 The resultant pieces combined elements from traditional 18th Century design with modern and extravagant adaptations. These works were particularly recognised for the quality of their finishes and attention to detail. In 1900, Linke exhibited an extraordinary Grand Bureau at the Parisian Exposition Universelle, for which he was awarded the Gold Medal. With this award, Linke's reputation was further augmented and many important private commissions followed. These commissions are responsible for many of Linke’s most iconic and beautiful works. After the turn of the century, Linke continued to use international fairs to explore new markets. He exhibited at the 1904 World Fair in St. Louis, the Liege Fair in Belgium and the 1908 Franco-British exhibition in London, while at the same time running a showroom in the fashionable Place Vendôme in Paris. Business flourished until the start of World War II, which marked the start in the decline in popularity of the Ancien Régime styles.